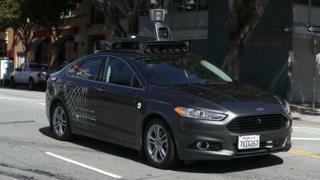 Uber has said it is suspending self-driving car tests in all US cities after a fatal accident. A woman was hit by a car and killed as she crossed the street in Tempe, Arizona. Uber said it was cooperating with local authorities in Arizona following the crash. The death comes a year after Uber took its self-driving cars off the road following an accident that left a Volvo SUV on its side in Arizona. Uber chief executive Dara Khosrowshahi said the death was “incredibly sad news”. “We’re thinking of the victim’s family as we work with local law enforcement to understand what happened,” he said in a tweet.